My pen friends are the best, and Carmen (@ccorrada) might be the leader of the pack. Her latest trip took her to New York City, and she stopped by the Muji store to pick me up one of the newish Refillable Aluminum Pen Cases for their super popular 0.38mm gel ink refills. Muji prides itself on minimalism in its design, but even more impressive to me is the seamless functionality of the few parts involved. The barrel has three parts - the tip, the barrel, and the cap - and any other Muji gel retractable ink cartridge fits right in. The neatest part (which I managed not to take a picture of - and neither did Amy) is how there is a cutout on the top of the cap to allows you to see what color ink refill you have loaded. Muji applies Apple's "It just works" philosophy perfectly to minimalism, and this pen is no different. I have raved about the performance of the ink cartridge time and time again, so no need to rehash that other than to say I have yet to have any performance problems to speak of. What made this one unique to me was the fact this was a needle tip refill, where I have only used the conical tip in the past. In fact, I don't even see the needle tip as an option on their web site, so I'm pretty happy to have been sent this one. Since these aren't the easiest pens to come by, you should be sure and grab one or several if the opportunity ever arises. 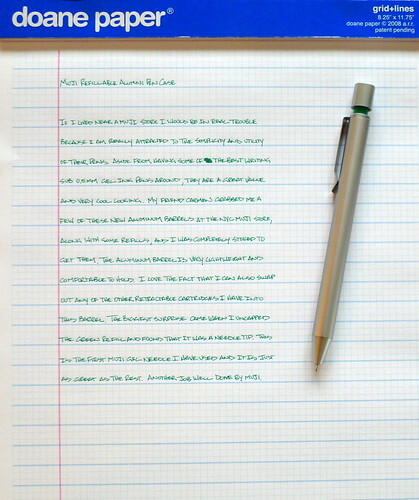 Posted on June 9, 2011 by Brad Dowdy and filed under Muji, Pen Reviews.